We arrived at camp at around 12:30 and greeted by our camp guides for the week. Their names were Steve and Luke. The camp provided us with 3 large carts to haul our belongings from the car to camp. Two of which were pulled by the older scouts going to Prospect Hill and another one for younger scouts were going to Williamsburg. Our stoves – they are HEAVY!!! Next, our guides gave us a tour of the camp, taking us to places like the quartermaster’s building if we need supplies like toiletries, cooking equipment, and or if we need something repaired. Later, they showed us where and how the food will be distributed, then we went to aquatics to talk about the rules for a safe swim. After the talk, scouts who had water activities on their schedules or just wanted to swim. Dinner was served to us only on the first day, we had to make our own dinner from then on. 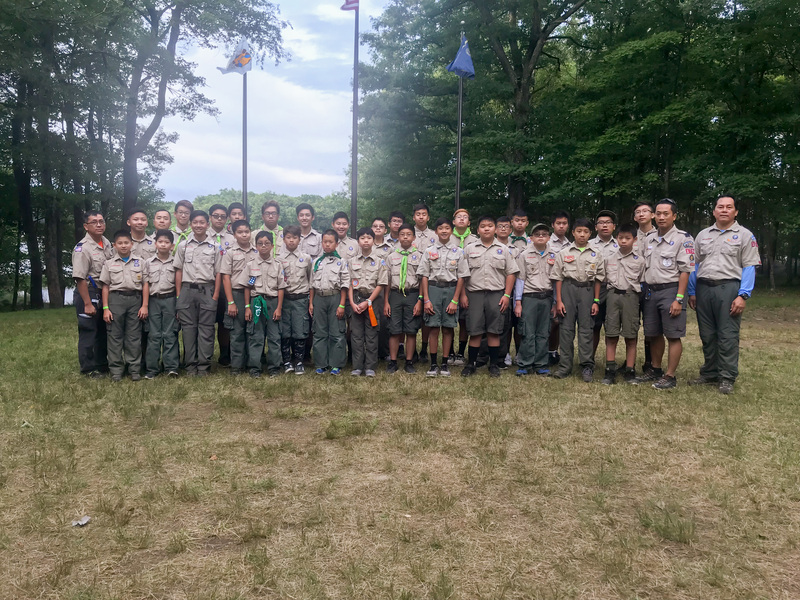 After the first day, the next 5 days (Monday – Friday) is routine with meals, personal time, and merit badge classes. Each morning, we woke up around 6:30 am-7:00 am. One of our 4 patrols would attended the flag ceremony each morning by the lake. After the ceremony, each patrol had to send 2 scouts to the quartermaster’s storage area to get the raw material for our breakfast. Breakfast usually consisted of eggs, toast, fruits, milk, and cereal. After we cooked, ate, and cleaned, we went to our merit badge classes. We returned to camp from classes around 11:30 am to prepare for lunch. Just like breakfast, each patrol had to send 2 scouts to the quartermaster’s storage area to fetch the raw material for our lunch. Lunch usually consisted of sandwiches, chips, and some sort of drink. After lunch, all of the scouts would go to various location in Camp Liberty to attend the afternoon sessions of merit badge classes. After the classes and our free choice activities, we returned to camp for dinner. Cooking dinner usually involved firing up the big stove. However, there were days that we cooked using dutch oven and tin foil cooking. The camp provided all of the cookware including tin foil, dutch oven, and charcoal. Between meals and classes, scouts enjoyed the offerings at the trading post. Since it was the last week of operation for the camp, the trading post discounted all perishables like $1 equals four cans of soda. Scouts also liked to gather at the dock behind the flags to take pictures and get phone service. At night, you can see the ripples in the water in the moonlight, making a white path in the water. And off in the distance you can see the lights from Camp Independence. On Friday, all our swimmers that were practicing for the mile (Francis and Kevin 2) went to Camp Freedom aquatics to do the mile. Camp Freedom is about a 10 minutes walk from Camp Liberty. But sadly as the mile was going on, they had to cancel due to thunder. Finally at closing campfire, it started to rain just like it did at 2017 Goshen on the very last day but this time it wasn’t so bad. Then the next day we all packed up, placed the floorboards of our canopies up on a tree and conducted police lines to pick up trash. Overall the camp was a fun and joyful experience for everyone. Everyone got something out of the camp.